I'm trying to use Mac OS X 10.6's mediastreamsegmenter to take the audio input of my mac and turn it into a stream that I could listen to on the iPhone. No files appear in the 'stream' directory and when I try and use QuickTime Player X to connect to localhost:8080, no go. 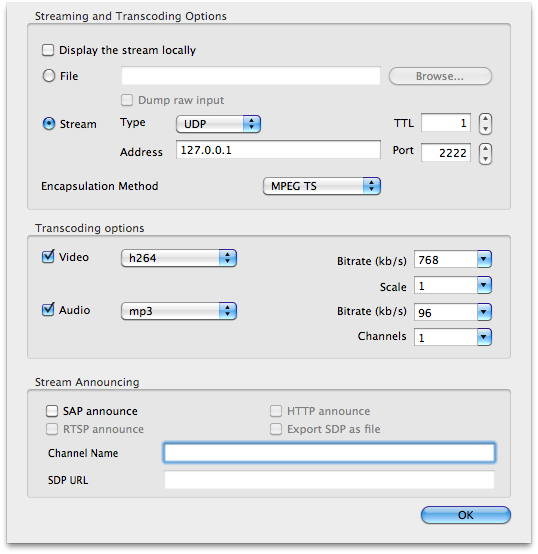 This tool receives an MPEG-2 transport stream over a UDP network connection or from stdin and divides it into a series of small media segments of equal duration. It then creates an index file containing references to the individual media segments. This means that you will need to have a UDP server running on the machine that you want to do the capture on, that is capable of pushing out the data in a MPEG2 transport stream. I wasn't able to find anything freely available that captures from a mic input, but here is a series of steps to see a working live streaming that will stream from your iSight. Before you start, you will need the latest version of VLC. Go to System Preferences, click on the Sharing icon and make sure Web Sharing is turned on. Not the answer you're looking for? Browse other questions tagged iphone quicktime mediastreamsegmenter or ask your own question. Why can't I access a web app running on my Mac via my iPhone?